When you start your own business, it is very unlikely that nothing will go wrong. Throughout your first few months or even years, you will make mistakes and hopefully these mistakes will be a learning curve for your future. I have now been running my own creative design business for around a year and a half and although things are much brighter now, in my first year I had a lot of ups and downs and had to find my feet in the world of self-employment. Trust me, those people who say they have never made any mistakes whilst running their own business are liars (sorry!) and want to make out like they are the best business owners in the world because of this. The word mistake has a huge negative connotation associated with it but my mistakes have become my strengths as I am a better and more confident business woman from making them. 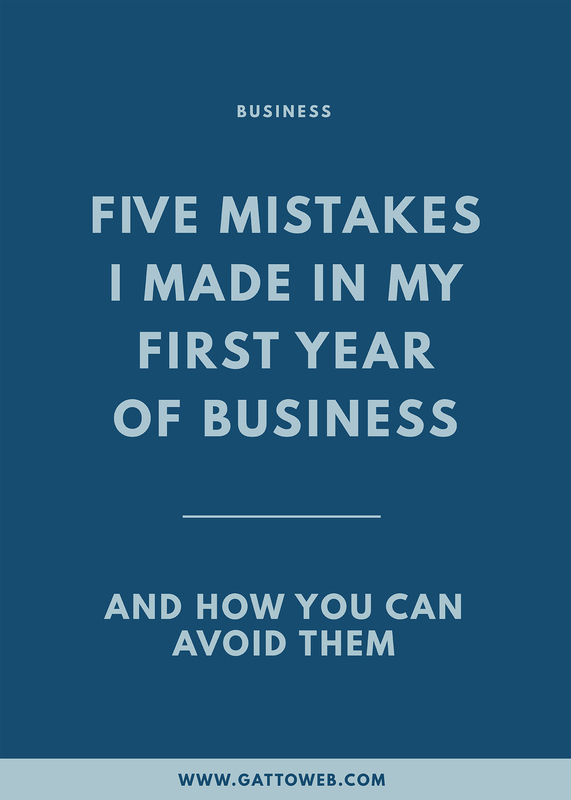 I would like to share with you five of my mistakes I made in the first year of my creative design business and a little bit of advice from me to make sure you don’t repeat my errors! As an initial tactic to retain some clients, I set my prices at rock bottom. The lower the price, the more people will want to work with me, right? Wrong. Well, half wrong. Yes, the lower prices brought me some business but these people wanted the same amount of work as they would have from anyone else with higher (more reasonable) prices. So, I ended up working just as hard as everyone else but for less than half of the income. Believe me, I do not run my lifestyle business just for the money but a gal gotta pay some bills! On top of this, it made it harder and harder to increase prices along the way when I got to know my real worth, as people had lower expectation of what they wanted to pay. Tip: Before you get started, sit down and work out a pricing strategy which will work for your clients and - more importantly - yourself. Calculate your expenses and your ideal disposable income, this is how much you will need to make, and then using this and the hours you work, you can figure out your hourly rate. As a Maths graduate, you would think that finances would be a strength of mine but in the early stages of my business, this was something that often got ignored. My main thought was getting the money in and keeping records of this was pushed to the back of my mind. Flash forward to my first tax return deadline and I spent many a late night sorting through bank statements and receipts to make sure I had all my records up to date and ready for the tax man! Not only did this take a lot of time but it meant I didn’t know how much tax I would end up paying and my savings account took a bit of a hit. Since the end of January (the dreaded tax return deadline) I have been consciously taking much better records and keeping all receipts for expenses. I have heard there are many excellent bookkeeping programs which would be a great help but for now, my trusty spreadsheet is doing the job. I’m hoping this is something I can improve this year. Tip: As soon as your business starts making money, keep a record of all outgoings and incomings. Also, a good rule of thumb for saving for tax is to keep one third of your income aside. This is something which I have only recently shook out of my system and something a lot of freelancers struggle with. When I first started working for myself, I worked as many hours as physically possible and felt guilty if I was spending my time doing anything other than work - a dangerous habit. Working long hours quickly lead to an unhealthy lifestyle and mind. I was reaching burnout and even worse, I wasn’t even seeing any benefits to working such long hours. The classic mantra is “work smart, not hard” and this is something which I have definitely learnt the hard way. Once I realised I was working myself into the ground, I streamlined my booking process so I had a manageable client load and worked a stricter routine into my week. Hey, I even give myself most weekends off! Tip: If long working hours are causing you grief, sit down and try to create a routine for yourself which will benefit both your work and your mind. If it helps, give yourself a strict ‘stop working’ time and make sure you stick to it. Once my workload started increasing, I was incredibly happy with where my business was at and my design expertise were growing with each client I worked with. I felt like I was getting better at my design work and my style was evolving. This all sounds like a good thing, right? Well it is and it isn’t. Because I felt like my own skills were progressing, I didn’t put any time into educating myself in anything new. The expertise I had already were getting better, but they were always in the same areas. I wasn’t reading any books about business or learning any new programs and this meant I was stuck in the same spot with my work. Now, I try to set aside one day a week to dedicate to my business and myself as a designer and I use this to try to learn a new skill or read into new trends and programs which may help with my progression. Tip: Don’t forget that education doesn’t stop when you start a business! To keep up with current times, you constantly have to educate yourself with new practices and this will in turn help your creative business. The main reason my business started was through fashion and beauty blogging (unfortunately, this blog doesn’t exist anymore!) and so you would have thought that a blog is something I would have continued throughout my business journey. When my client work started building, a blog became an afterthought and I didn’t even think it was something I could use as a marketing tool. I occasionally wrote a post about a services update or any business-related news but nothing that people would come to my website specifically to read. Since relaunching my website, I have really got back into the swing of things with blogging and it has become a great tool for marketing my design services. As well as this, it is a great outlet for me to be creative in a different way and writing is becoming a bit of a hobby! Tip: If you struggle to think of things to blog about for your business, write about your personal experiences at first and then the more you write, the more inspiration you will have. I hope you have enjoyed reading about my experiences in the first year of my business and I would love to hear if you have learnt from any mistakes whilst running yours. I genuinely believe that we must make mistakes to learn and grow in our creative business and become the bosses that we are today!